With this fight report, SaddoBoxing is trying out a revolutionary new concept. We sent two of our Southern California correspondents, Parimal Rohit and Joe Ulrey, to cover the Roy Englebrecht Promotions card last Thursday at the Marriott Hotel in Irvine and will now present their individual reports, both very different impressions, in order to provide the most complete review of the show possible. Women Cards Impress Fans at "Ballroom Dance"
Someone call 911! One fighter has high blood-pressure! Another fighter has a bloody face! The women's bout caused the fans to have a heart-attack! It's a good thing the California State Commission held the start of the fight for 30 minutes. After Roy Englebrecht Promotions realized they had the wrong medical personnel a few minutes before the first bell, the Commission had the night's organizers scramble to have an ambulance at the facility instead of the paramedics. Based upon what happened when the fights started, I doubt the medics knew what they had in store. The Commission made the right call. For the second date of its season, "Battle in the Ballroom" has sold out its card at the Irvine Marriott with over 1400 fans in attendance. They weren't disappointed on this night. 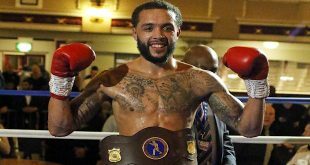 After an average season opener in February, Roy Englebrecht's matchmaker put together six solid bouts and all scheduled bouts were actually fought tonight. To add to the excitement, the fight card included two female bouts. William Bailey of Bakersfield, CA started off the night with his matchup with Ricardo Garcia of Reseda, Nevada. After this four round light heavyweight fight was over, it was obvious why an ambulance was necessary. Bailey dominated the early rounds, taking shot after shot to Garcia's head. By the end of the third round, Garcia took so many blows to the head that he was drenched in his own blood. This fight should have been over by the second round. Yet, it ended up going to the judges for two reasons. Despite landing many blows to the head, Bailey didn't seem to pack a lot of power in his punches, which allowed Garcia to withstand the blows. Also, Bailey underestimated Garcia's heart; Garcia played like a warrior. Even though he took major body and head shots, and despite all the blood he lost, he still stood his ground and fought courageously. His heart and courage led to a standing ovation to the anxious crowd that waited an extra thirty minutes to see this fight start. Garcia's heart wasn't enough to convince the judges, however. 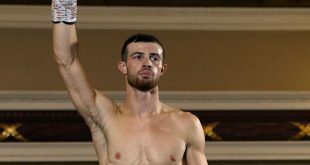 The Bakersfield native won by unanimous decision, as Bailey improved to 1-1. Garcia dropped to 0-2 despite the courageous fight. No doubt, if Garcia continues to fight this way with proper training, he'll be a solid professional boxer. Beto Ibarra of Santa Ana, CA, who almost did not fight because of high blood pressure just before the contest, took on Richard Alduenda of Los Angeles in the second bout. The two lightweights got of to a fast start, with both fighters landing quick punches and headshots. Ibarra dominated early, and late in the first round, knocked Alduenda to the ground with a short left hook to the head. Alduenda recovered well, and fought better as the fight went on. In fact, Alduenda's surge in the third and fourth rounds, where it appeared Ibarra ran out of steam and started taking more body shots, had the crowd believing the L.A. native might win the battle. The fight went to the judges after a hard fought fourth round, with a split decision in favor of Ibarra. Alduenda gracefully congratulated Ibarra in the ring. When Ibarra stepped out, he stated why he won: "That knockdown in the first round did it for me." Indeed, it was a good knockdown, and demonstrates Ibarra's power. With the split decision, Ibarra improves to 1-2, while Alduenda drops to 1-5 (1). After two solid bouts, the stage was set for the first of two women's fights. The anticipation and electricity in the crowd was rampant. Luz Gonzales of Ontario, CA made her debut against Paula Cortez of Montclair, CA. The four round, junior welterweight fight had plenty of fireworks from the second both women entered the arena. Cortez came in with a ten person posse, wearing a bright purple and gold outfit. Once the bout started, both contestants fought an even fight for the first two rounds, although Cortez appeared to have the physical advantage over Gonzales. Cortez took advantage of her physical dominance in the third round, as she became more aggressive, chasing Gonzales around the boxing ring, landing solid body and head shots. As the third and fourth rounds continued, it became clear that in her debut, Gonzales was in over her head. Cortez's speed and strength was too much for Gonzales, and the judges scored the fight a unanimous decision in favor of Cortez, who improved to 2-0 (1); Gonzales dropped to 0-1. After an exciting women's bout, the fans had to sit through two men making their professional debuts before the next female fight. 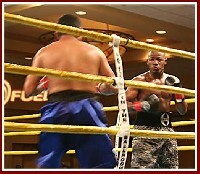 Aarron Morgan of San Francisco took on local fan favorite Paul Velarde of Tustin, CA, in a four round welterweight matchup. Growing up only a few minutes away from Irvine, Velarde had a huge contingency of backers in attendance. While the fans constantly chanted "Pauley, Pauley, Pauley" throughout the match, Velarde looked like a fighter making a debut, whereas Morgan fought smart. It was obvious to the neutral fan that Morgan was the better trained fighter. Although Velarde chased Morgan around the ring, "Pauley" fought with more reckless abandon than his opponent. Morgan was more systematic; land a jab to the head or a body shot, then step back. He consistently did this for all four rounds. When it went to the judges, the cards were scored unanimously in favor of Morgan. There was a mixture of cheers and jeers from the crowd, as Velarde stormed off the boxing ring in anger. Many fans believed it was a controversial decision, stating that Velarde was a better fighter and Morgan should not have won because he was "chased" throughout the fight. Yet, perhaps one of Velarde's own fans put it in proper perspective. Manny Garcia, of Tustin, CA, said, "I've seen Paul fight better as an amateur. Yes, he chased Morgan around a lot, but Morgan was calm and controlled the fight better. Paul just didn't fight the way he should have. I thought the fight was relatively even, so I am a little surprised that the decision was unanimous. But Morgan did deserve to win." With the unanimous decision, Morgan goes to 1-0, while Velarde loses his first fight and begins his career at 0-1. The exciting and controversial fight made the wait between women's fights worthwhile. The fans got a treat with the second female fight, between two junior welterweights. Miriam Nakamoto of Los Angeles would fight Kina Malpartida of Peru. Kina has fought at "Battle in the Ballroom" in the past, and developed a small following here at the Irvine Marriott. As she had dominated her fights in the past, it appeared she was the favorite against Nakamoto, who was fighting in only her second professional bout. Yet, within thirty seconds after the first bell, the fans were dumbfounded when Kina fell to the floor. Nakamoto, who's stance and 'approach appear very nonchalant and relaxed, didn't appear to do much to knock Kina to the ground. Kina even appeared baffled, and many fans thought it might have been a mere accident or trip. But lightning struck again in the second round, when Nakamoto amazed the crowed by legitimately knocked Kina down three times over a seventy five second span. It answered any questions anyone had about the first round knockdown. Kina was in an utter shock the rest of the fight, and her frustration became apparent late in the third round, when she landed an elbow on Nakamoto's shoulder. Kina tried to take out her frustration in the fourth round, and landed a couple of good head shots, but unless she knocked out Nakamoto, there was no way she would be able to overcome the first two rounds on the judges cards. Indeed, when the final bell rang, it was clear who won. Addressing the crowd, who gave Nakamoto a standing ovation, announcer Mike Hart declared Nakamoto the winner by unanimous decision (with each judge scoring the match 40-32). Kina walked off in dismay, and the crowd went crazy over Miriam, as she improved to 2-0 (1). Kina suffered her first defeat, and she is now 6-1 (1). With five amazing bouts, all providing good entertainment and legitimate boxers, the main event was anticlimactic. The super welterweight matchup saw Ricardo Galindo of Mexico City fight Cleotis Pendarvis of Los Angeles in a scheduled six rounder. Many of the fans began to trickle out as these boxers fought conservatively through the first four rounds. The scorecard was probably even at the end of the fourth, as neither boxer did anything to gain an advantage over the other. When the fifth started, Pendarvis started to gain some confidence, and became more aggressive. He started forcing Galindo to back up, and took more body shots. Pendarvis never landed any blows which would lead to a knockout, but he did land more body shots than his opponent. While the fans were not convinced who would win the fight, the conservative approach seemed to help Pendarvis, as his confidence in the final two rounds was enough to earn the unanimous decision, helping him stay undefeated at 5-0 (1). Galindo dropped to 2-3 (2). A bloody face, an anxious boxer, two women that put the men's fights to shame, and an apparently controversial decision â€“ no wonder the State Commission was so adamant about having the ambulance at the venue. Indeed, it was an excellent fight card, much better than the season open in February. Fans definitely walked away happy and got their money's worth. One fan made the drive all the way from suburban Seattle to watch the card. A relieved Roy Englebrecht, who promoted the fight, provided his take on Thursday night's card: "We almost didn't have the second fight because one of the boxers had high blood pressure, and right after that, the entire evening almost was canceled because we didn't have the right ambulance here. But, everything came together, my staff came through, and the boxers went out there and entertained the fans. We had some great debuts and a few boxers will definitely be going places after fighting here tonight. 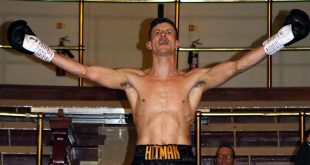 It's what 'Battle in the Ballroom’' is all about â€“ helping young boxers move up in this wonderful sport." Indeed, many boxers will be making a name for themselves after fighting in "Battle in the Ballroom." This is not your father's prom or ballroom dance. When fans come to the Grand Ballroom of the Irvine Marriott, a fight is guaranteed to break out. There she was, standing in the middle of the ballroom grinning from ear to ear, tears streaming down her face, worrying about her hair being messed up for the photos. She could have been holding a bouquet of roses, but pretty young Miriam Nakamoto of Los Angeles was clutching a trophy instead. You see Miriam wasn't at prom night, she was proudly standing in the center of the ring at the ballroom of the Irvine Marriott. She was celebrating a hard fought victory over local favorite and previously unbeaten Kina Malpartida of Peru in a 135 pound contest. This was only Miriam's second fight and not many in the crowd gave her much of a chance to win against Kina, who was 6 and 0 with one knockout. Miriam appeared friendly enough. She was wearing "pigtails" and appeared somewhat shy. She was smiling as Kina entered the ring with much fanfare and even applauded as Kina was announced. That all changed quickly. Shortly after the bell rang, Kina went to work, jabbing and moving in to Miriam. Out of nowhere, a single right hand knocked Kina to the canvas. Kina does not like the taste of leather and likes the taste of canvas even less. She was up quickly and tried to step up the attack. She was in trouble several times in the first round from right hands. The second round wasn't much better for Kina. She tasted much leather and tasted the canvas two more times. It was now very apparent that if this was prom night, Kina had definitely punched the wrong dance card. Miriam stayed calm and kept the pressure on. Kina barely survived the round and attempted a shot to Miriam after the bell. In the third round (you guessed it) Kina was knocked down one more time by a right hand. She was up quickly and stayed with Miriam as best she could. However, the "spanking" continued for the third and fourth rounds and Miriam won the unanimous decision. Miriam was delighted by the victory; she had taken the fight on seven days notice and had to shed eight pounds to make weight. Trainer Buddy Bereal (a former top notch welterweight) explained that her training is grueling and includes sparring with 147 pound men. It all paid off in grand style for Miriam Nakamoto as she literally stole the show at the Irvine Marriott. The main event followed. Needless to say, 148 pound Cleotis Pendarvis of Los Angeles had a tough act to follow. 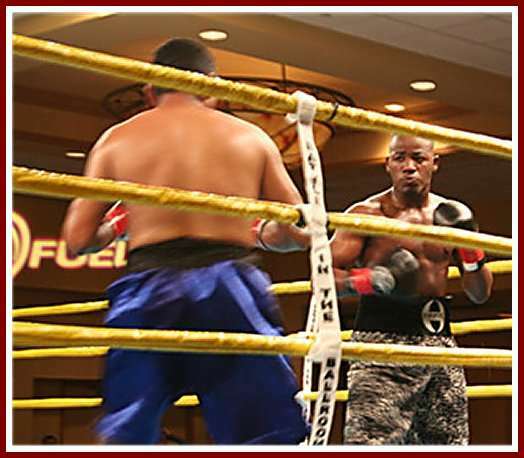 Left handed Cleotis jabbed and moved his way to a unanimous decision victory over Ricardo Galindo of Mexico in a six round fight. Ricardo was persistent in his attack and caught Cleotis frequently. Cleotis is quick and would retaliate with flurries of punches and circle Ricardo. Cleotis is now 5-0 with one KO and Ricardo falls to 2-3 with 2 knockouts. The evening started with a bout between two light heavyweights, Billy Bailey of Bakersfield, California and Ricardo Garcia of Reseda, Nevada. Both men were looking for their first victory. Bailey was aggressive throughout the bout and stayed toe to toe with Garcia. After the second round, Garcia was bleeding through the nose. Garcia would not back down. However as the fight progressed, Bailey began to dominate the exchanges more and more. At the end of the four round fight, Garcia had absorbed a lot of punishment, but stayed on his feet. His manager attributed this to a lot of heart. Bailey won a well-deserved unanimous decision and his record is now one win and one loss. The second bout featured lightweights Richard Alduenda (1-4) versus Beta Ibarra (0-2). These guys fought hard throughout the first round. In the second round Beta dropped Richard with a right hand. Richard was up quickly, fought very hard for the remainder and probably won the last two rounds. However the knockdown proved to be the difference as Beta Ibarra recorded his first victory by a split decision. Once again, the women took center stage. 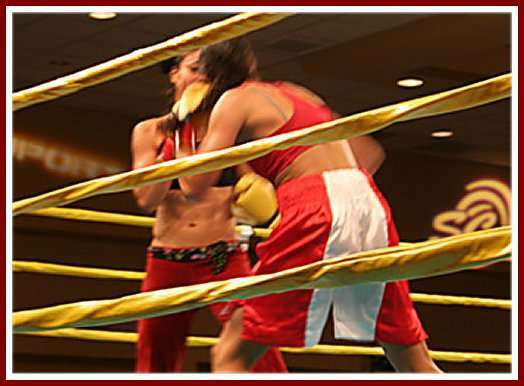 135 pound Paula Cortez of Chino, California took on Luz Gonzales of Ontario, California in a four round bout. Paula had been stopped in her debut and was looking for her first win. Luz was making her debut and wore the names of her two children on the back of her trunks. Luz was competitive with Paula in the early going, but in the second round, Paula began to connect more and pull away in the fight. In the third round Paula knocked Luz down with a right hand. She continued with a two fisted attack for the remainder of the fight and won a unanimous decision. 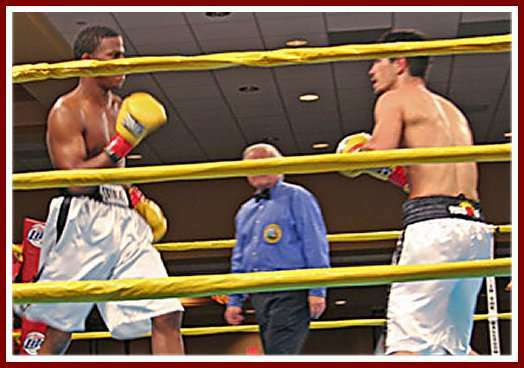 Aarron Morgan of San Francisco made his professional debut a successful one against local boy Paul Velarde of Anaheim, California. Both weighed in at 145 pounds. Despite an aggressive and valiant effort by Velarde and the incessant chanting of "Pauly" by his loud friends, Morgan dominated with quickness, an excellent jab and flurries of punches. Velarde would land one or two punches and Morgan would counter with several punches and move away. 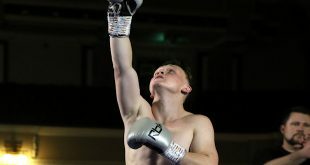 This was an impressive debut for both young men and Morgan won a unanimous decision. All in all, the "Battle in the Ballroom" was an excellent evening of boxing.